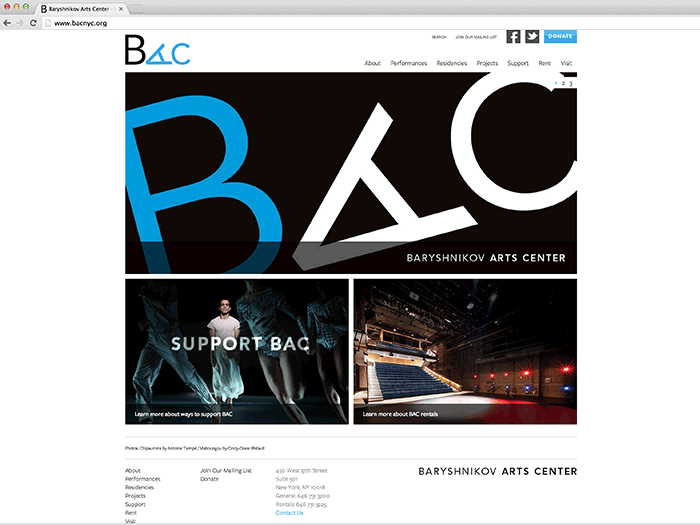 Baryshnikov Arts Center is Mikhail Baryshnikov's Performance and Residency Arts Center for Dance, Music, Film, and Visual Arts in Manhattan's Hell's Kitchen neighborhood. 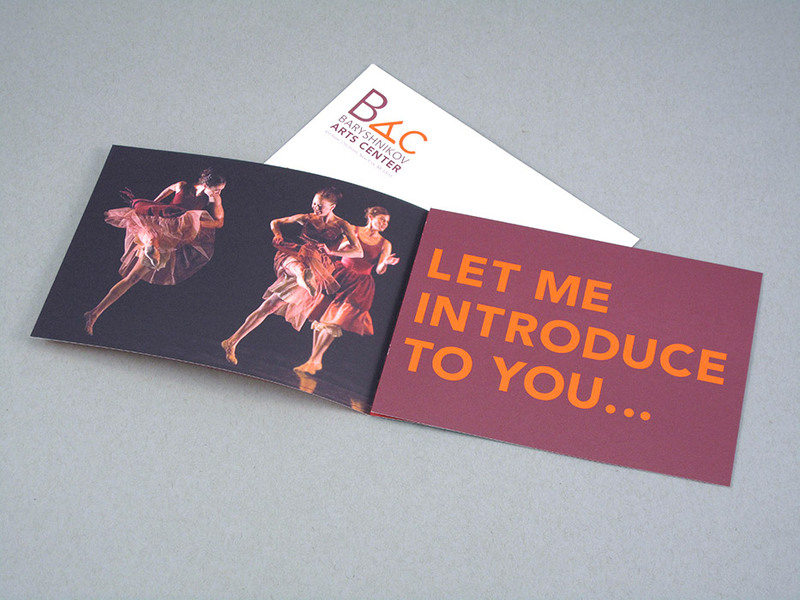 BAC has been a client since 2007 when Vixjo Design, Inc. was hired to design the branding for the then new organization. 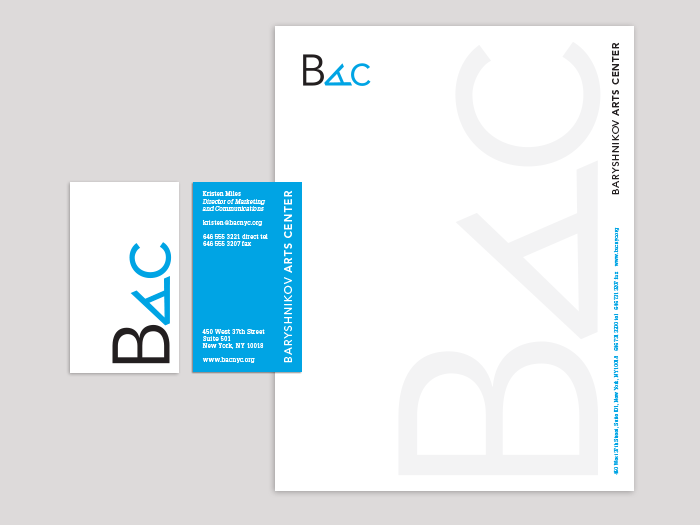 We designed the BAC brand in 2008 for the then new organization, located in Manhattan's Hell's Kitchen neighborhood. 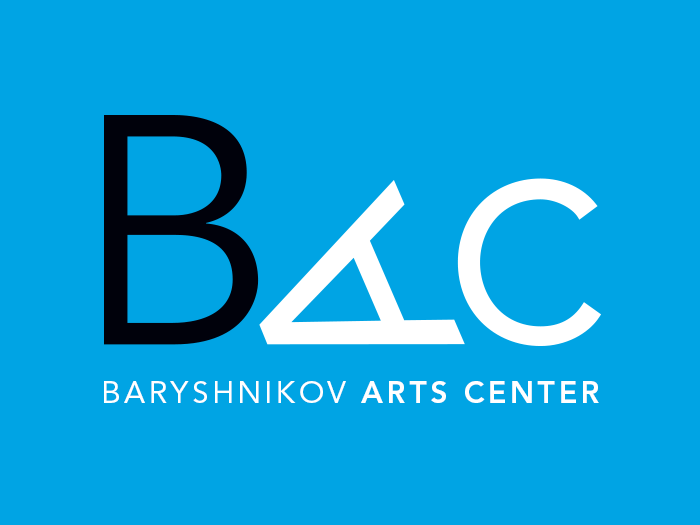 Operating previously as the Baryshnikov Dance Foundation, Baryshnikov Arts Center was looking for a brand that would highlight the building as a modern and creative arts space where artists from different disciplines would come together to create and perform new work. 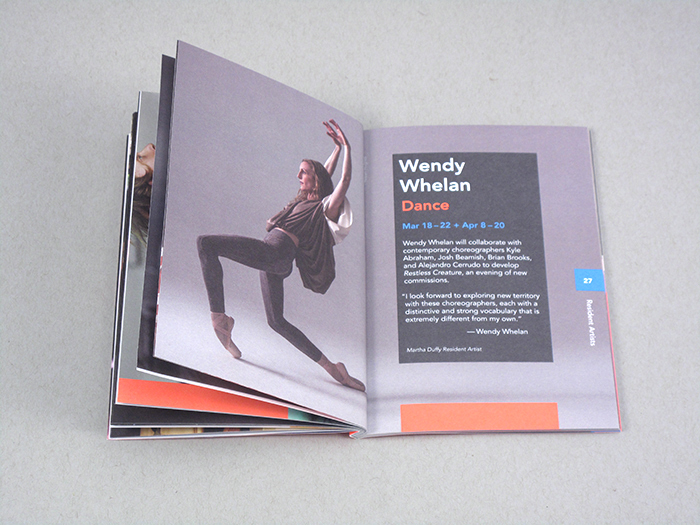 The logomark, when used in a vertical orientation, is a mix of sculpture and dance, appearing to a hold a pose, reaching upward. 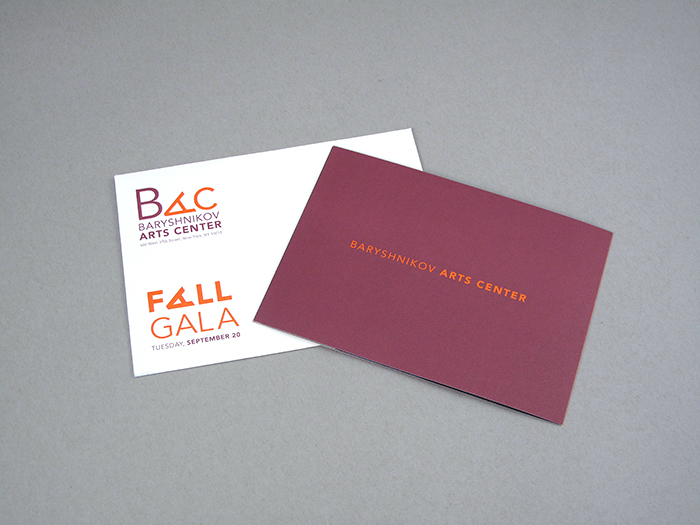 The emboldened "Arts Center" in the logotype puts the focus squarely on the arts and artists that fill their spaces. 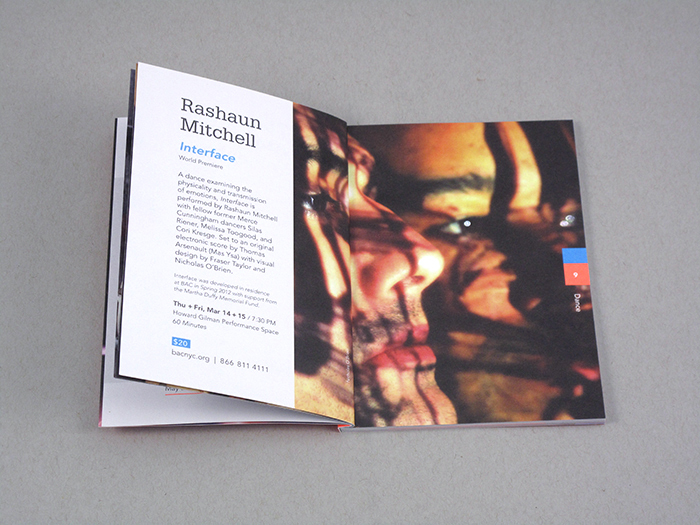 We designed the website with Perry Garvin Studio in 2012. 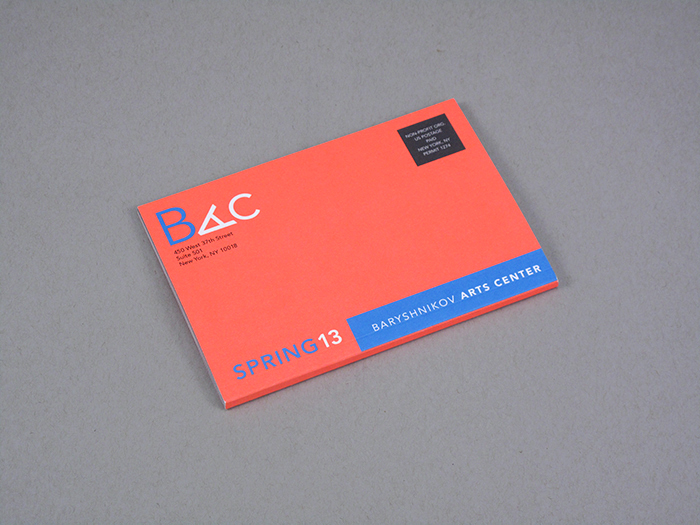 As we design the season book to announce the upcoming season's performances and residencies, we work with the BAC team to select a pantone swatch that will become the pop color of the season, appearing on the book cover and throughout the season's materials. 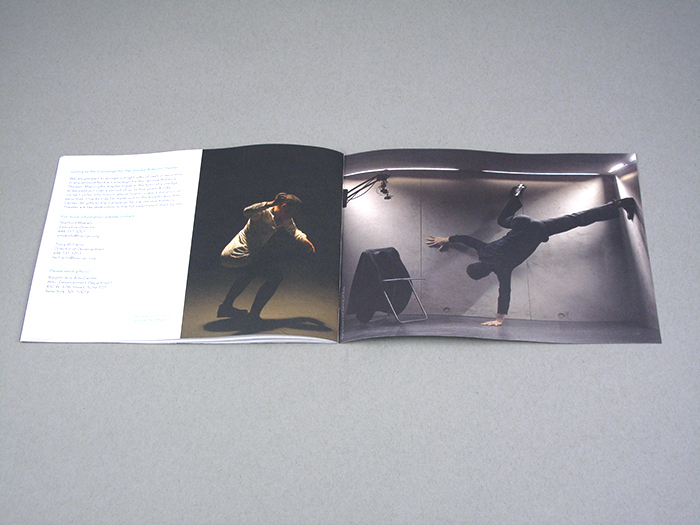 For the spring 13 season we stayed with the bright color palette of the previous two seasons and selected Pantone 805. 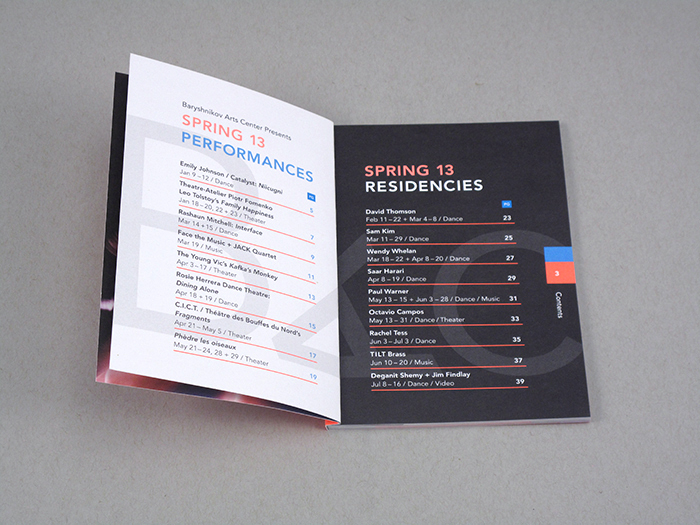 The BAC Season Books are printed twice a year before the spring and fall to announce that season's performances and residencies. 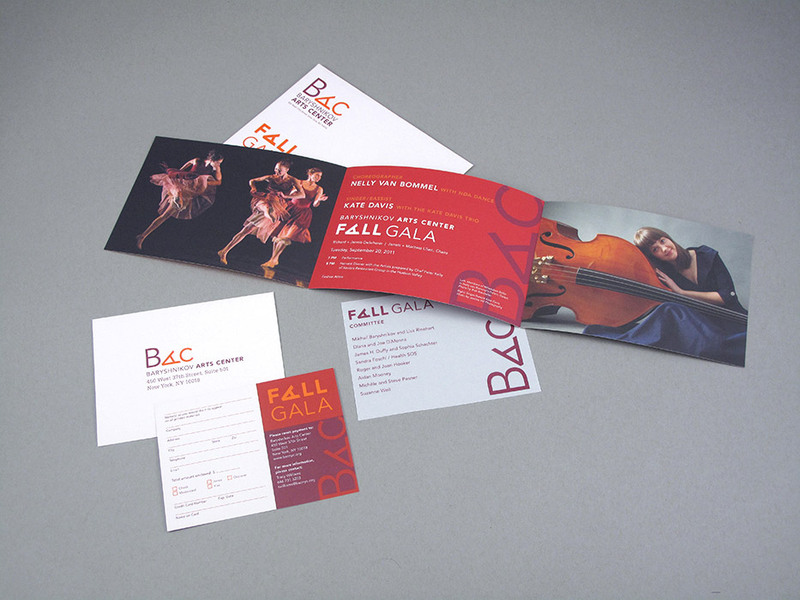 Before each season we select a color that will become the pop color of that season. 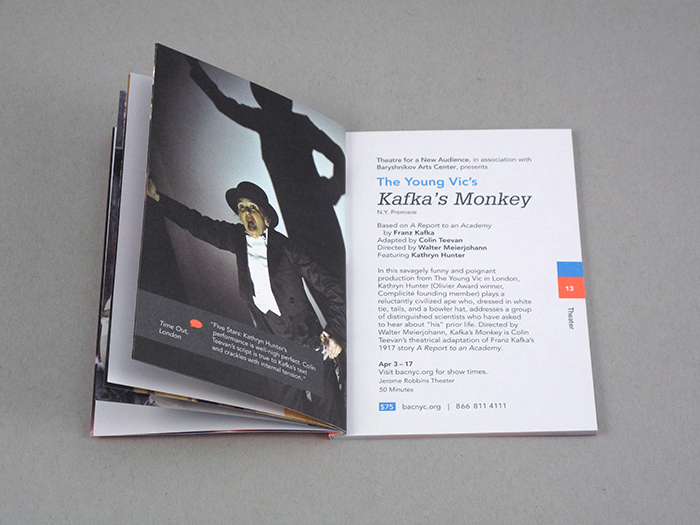 The books changed format in the Spring 2012 season to become a perfect-bound pocket-size book, but the style for a strong graphic (often typographic) and colorful design remained. 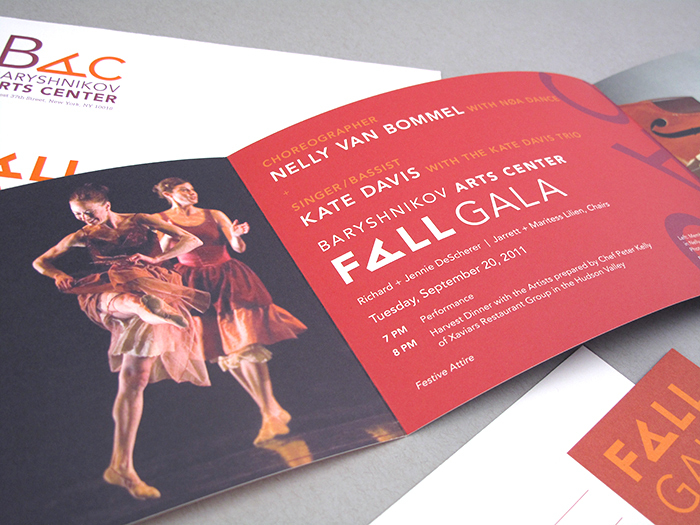 Recipients of this invitation are asked to attend a gala where they will have the first look at BAC's new Jerome Robbins Theater. 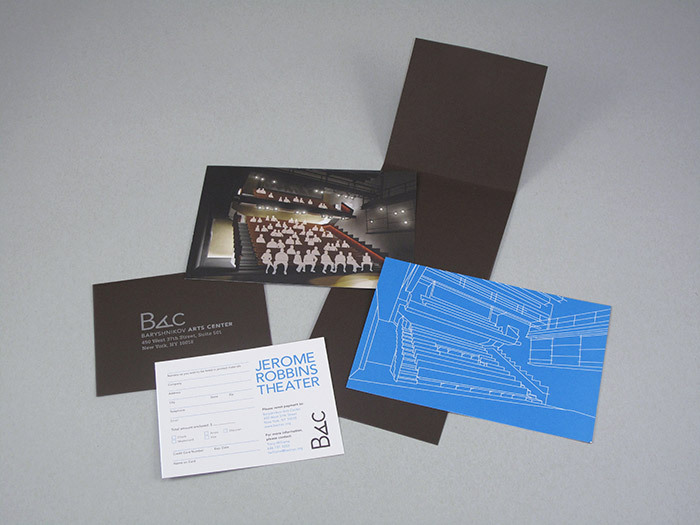 We wanted to the design of the invitation to build anticipation for this unveiling, so we included a paper wrap that held the invitation boards together, initially concealed the view of the space, and revealed an invitation message and an architectural rendering of the theater when opened. 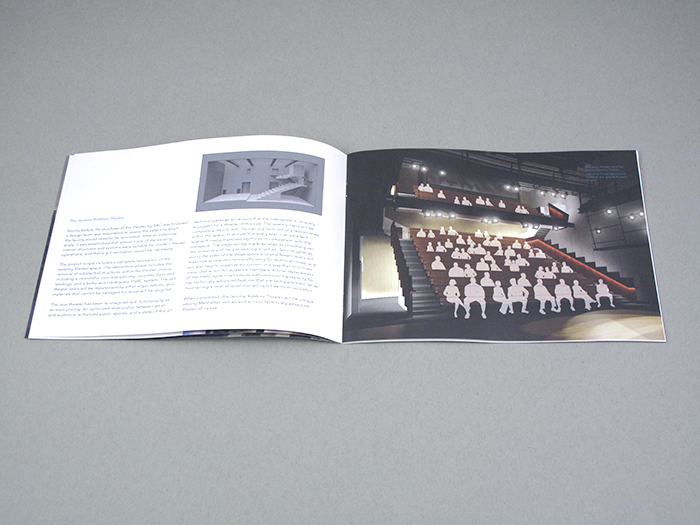 We also created a line drawing outlining the plans for the theater seating. 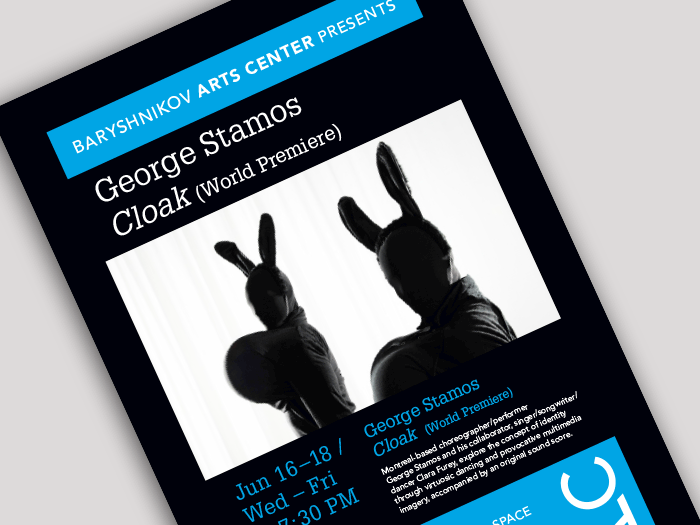 This drawing was also used as a decorative graphic inside the gala program cover. 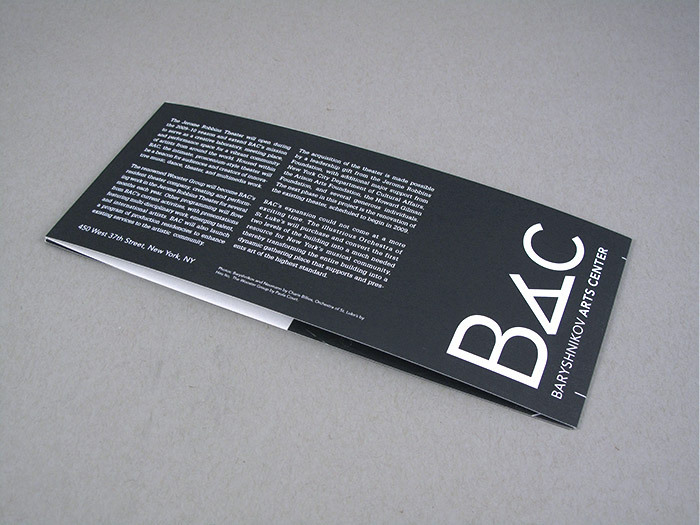 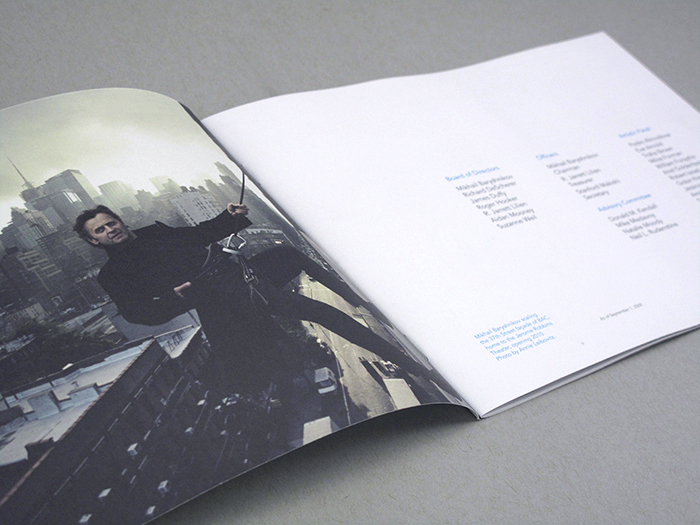 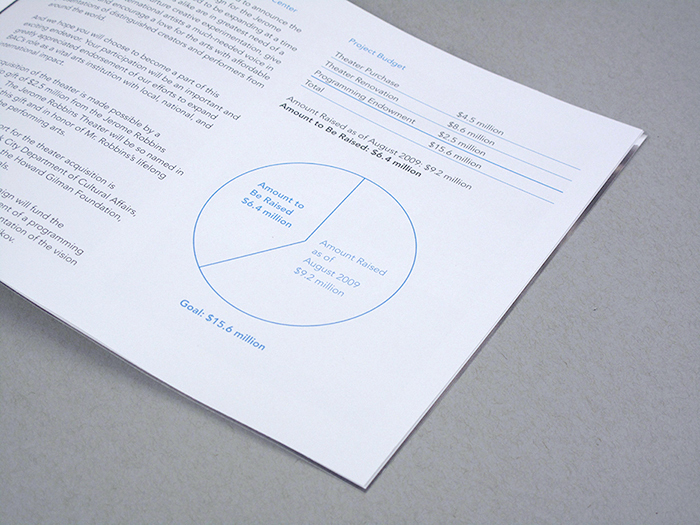 The program book was printed in-house and slipped inside the cover shells the day of the event. 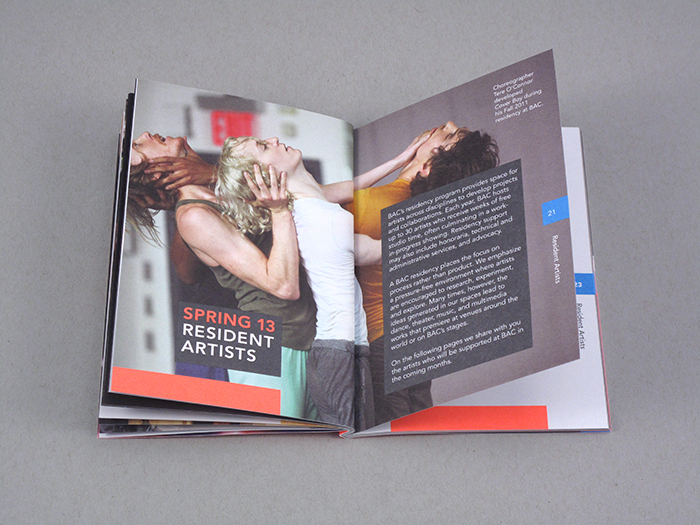 This book functioned as the main fundraising tool used by development officers to approach potential supporters of the renovation of the Jerome Robbins Theater. 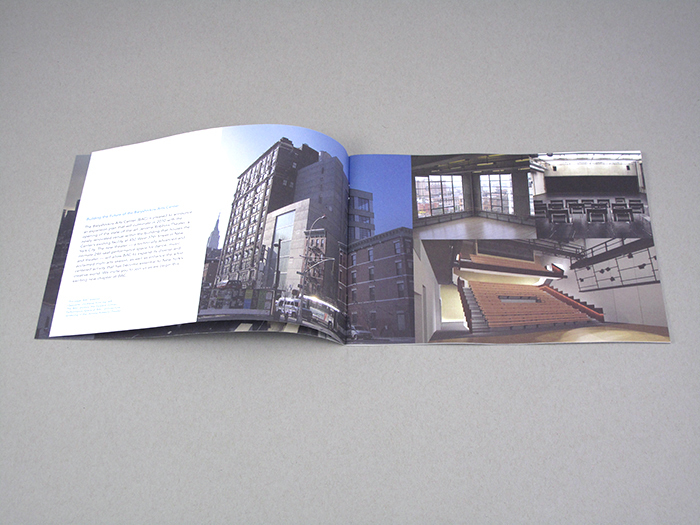 The book provided background information on the organization and the artists, provided architectural renderings of the plans for the space, and presented the giving levels, naming opportunities, and goals of the campaign. 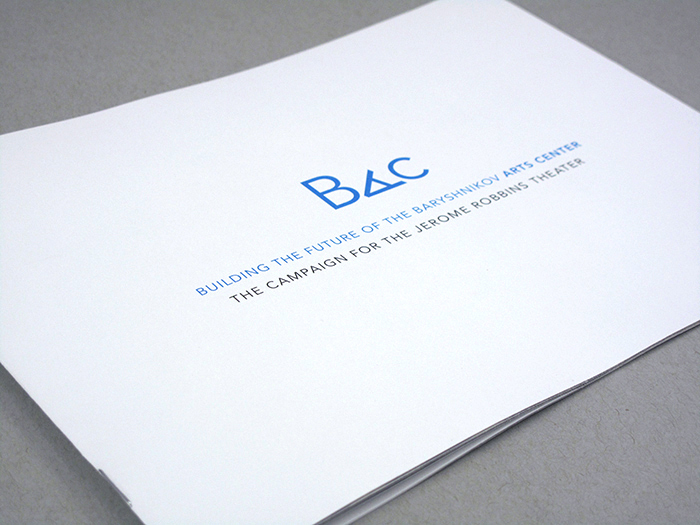 To coincide with the capital campaign's tagline "Building the Future of Baryshnikov Arts Center," we developed a set of JRT campaign branded elements in a black and white architectural style to create a deconstructed BAC logo and theater seating. 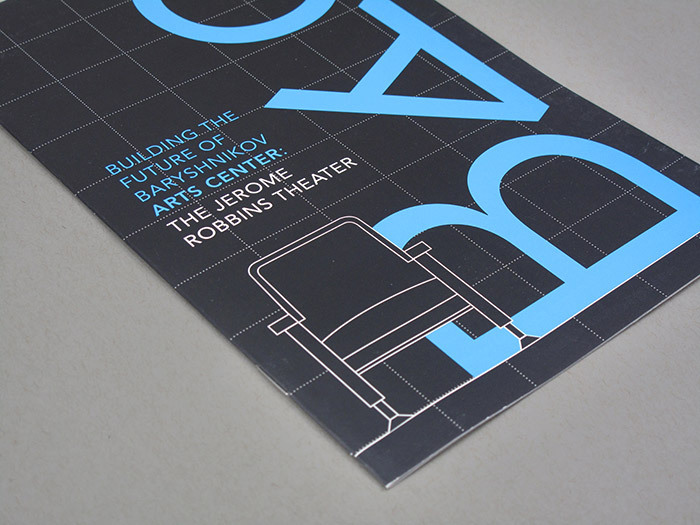 These elements appeared in the benefit invitation, a campaign booklet distributed at the event, and on a suite of materials developed during the 2-year construction of the Jerome Robbins Theater.